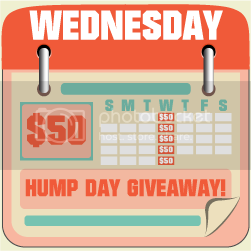 Thanks to the 26 wonderful bloggers listed below, it's time for Hump Day Giveaway where you'll get a chance to win $50! This week's task is for Facebook Page likes which is super easy to do. Feel free to visit all the wonderful blogs below once you're done entering the giveaway. You can log on to Rafflecopter via your Facebook account, or your name and email (just make sure you're Facebook is opened so you can easily like the pages). Once you've liked ALL the pages (page to be opened through the Rafflecopter form), leave your Facebook Profile Name (not a Business/Blog Page) on the space provided for Extra Info after doing the task so we can verify your entry. It would be best if you enable us to see the pages that you liked in your info tab so we can announce the winner ASAP. A note: Please join only on one blog/page. A maximum of 41 entries will be considered. If you have more than 41 entries, the host reserves the right to delete duplicate or fraudulent entries. Also, please use only one name and email address, or Facebook account for quicker validation of entries. On the first mandatory entry, please write Sarah's Blog Of Fun referred you. You must complete the first 2 tasks before the others are enabled. Thank you very much and good luck. By joining this giveaway, you agree to the Terms and Conditions on the bottom of the form. Contest is open all-day Wednesday, from May 30th, 12:01am EDT to May 31st,11:59pm EST (May 30th, 12:01pm Philippine time to May 31st, 11:59am Philippine time). Yes I love Hump Day - thank you & have a great day! Happy Hump Day- its a rainy one here too- quite fitting :) Thanks for all you do! Thank you so much- who couldn't use $50!!! I sure could use $50. Thanks for the chance to win this. I found it today !!! Love Hump Day! Thanks for all you do, love this site.